Every year, one of my daughters helps with a fundraiser for SMA (Spinal Muscular Atrophy) in Rochester, Minnesota. 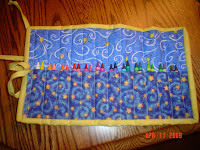 This year, another daughter and I made crayon roll caddies to donate to the fundraiser. 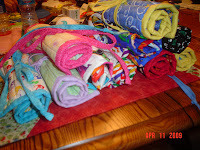 The pattern is from the "Quilts & More Magazine", Fall 2008 issue and is called "Color Me Happy" crayon rolls. 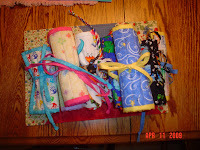 Here are photos: (1) The top photo shows the crayon roll opened, (2) the middle photo shows a top view of our "stack of crayon rolls", and (3) the bottom photo shows a side view of the same.